What is the Braille printer being used for? If the Braille printer’s primary use is for limited personal use or short-run light production, then a lightweight desktop braille printer is probably more than sufficient for your needs. This type of braille printer can easily accommodate a duty cycle of an hour or two per day. However, if you require a printer to run multiple hours per day, five days per week, or even two shifts five days per week, then a Braillo production rated braille embosser is required to provide adequate service. Braillo braille printers are precision made, using state of the art manufacturing techniques. The finest grade metal is hand-machined to exact tolerances and then assembled at our facility in Stjordal, Norway. Component parts that are either manufactured in-house, or custom made by CE approved suppliers, further guarantee the quality of the finished product. Braillo also manufactures its braille printers with such reliable mechanical parts that even older models can be upgraded with current electronics, features and speed levels—no other Braille printer manufacturer can offer such reliability and longevity in its products. 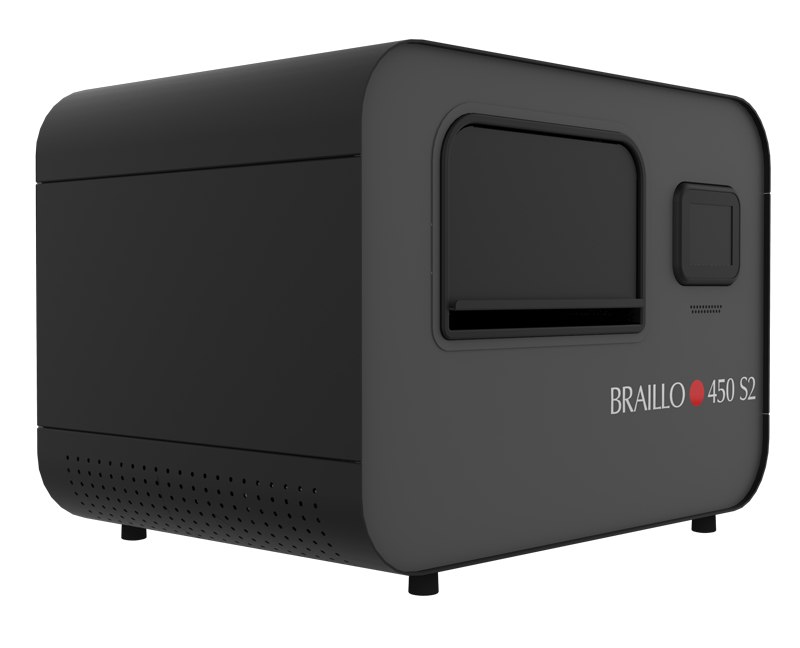 Braillo printers are built to last. Braillo braille printers are capable of around-the-clock Braille production, and it is not uncommon to have a Braillo printer still in service after 20 years and millions of Braille pages produced. We would be pleased to provide you with a list of references. Braillo braille is known as the “benchmark” for which all Braille printers are measured against. It consistently produces the highest quality Braille available. Consistent height and precise alignment allows for a perfectly formed Braille dot and Braille cell, facilitating easier reading. We are happy to provide printed braille samples that are produced on the specific Braillo embosser you are interested in purchasing. True Production Braille – what is it? When braille is required to be produced in large quantities, day-after-day and week-after-week – that is production braille. Braillo was established in 1980 with the development of the world’s first high-speed interpoint braille printer. Since then, it has focused its efforts entirely on true production braille printers. 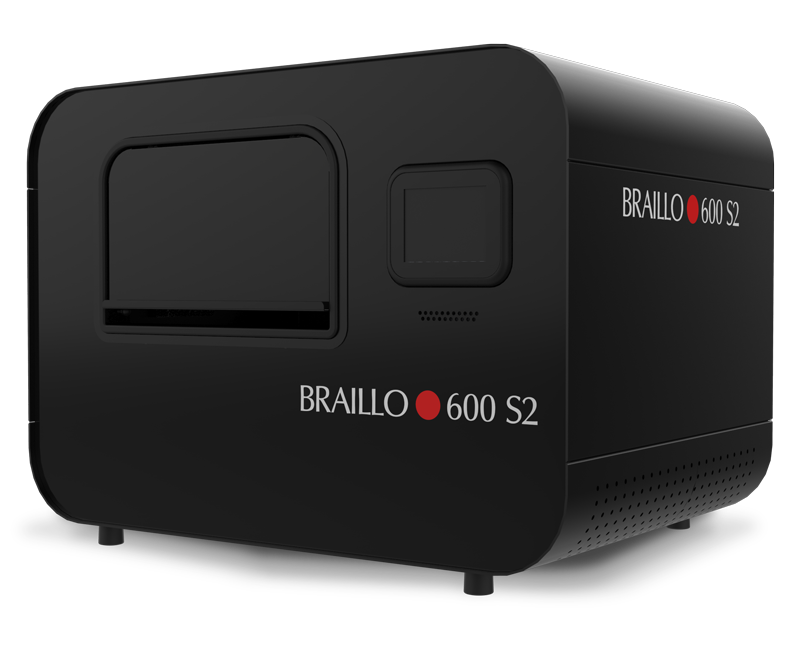 Braillo is the true innovator and leader in the braille printer category. Braillo printers are found in the largest braille print houses, as well as in educational and government facilities throughout the world. Its newest printer, the revolutionary 650SF, is a printer that uses paper rolls to produce complete braille magazine and book formats that are covered and bound in one hands-free procedure. All Braillo production braille printer models feature tractor feed or roll format braille paper options – the most reliable forms of paper handling. Tractor feed boxes generally contain 1000 sheets, and paper rolls equate to approximately 15,000 sheets. Compare this with cut sheet (sheet fed) braille printers, of which the largest has a capacity of 100 sheets (count sheets and not pages – in magazine/book format, 1 sheet = 4 pages, so this is a misleading specification). While they may be fast CPS-wise, it is difficult to call a cut sheet printer “production” when you have to stop every 10-15 minutes to load paper and/or remove paper jams. The actual page per hour or CPS rating falls dramatically when this reality is taken into account. There is simply no number of cut sheet printers or small desktop printers that can cumulatively compare to the efficiency, quality and output of a single Braillo braille printer of any model. In addition to reliability and quality, you need your true production braille printer to be fast. Check with the National Federation of the Blind and other agencies across the world, who offer true, real-world speed test results of all Braille printers on the market. Initially, Braille printers used only tractor feed/continuous Braille paper. 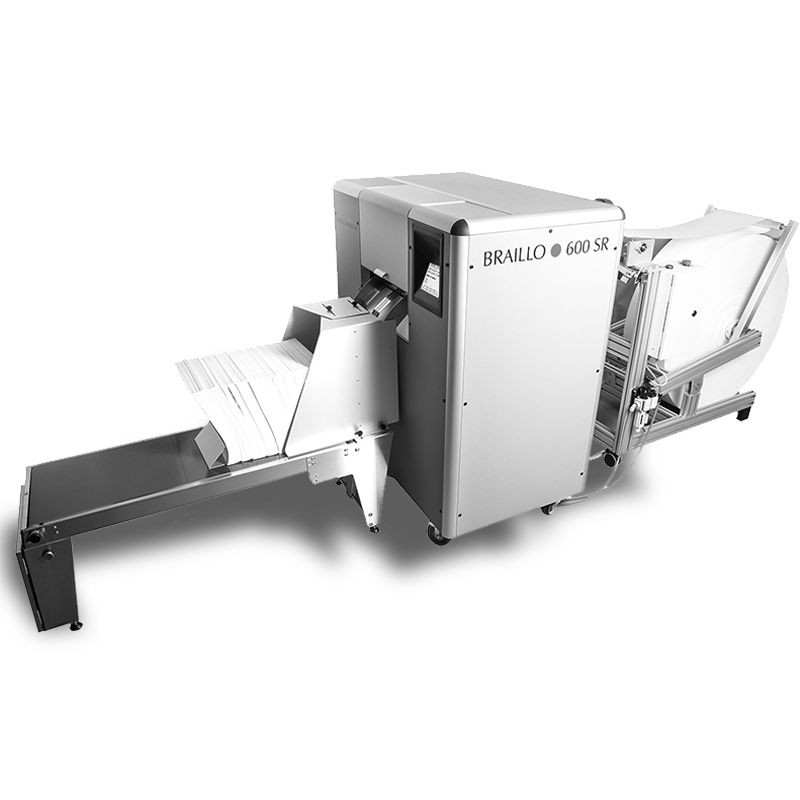 In an effort to lower production costs for Braillo’s customers, it was the first company to introduce roll feed printers. There is no question that using tractor feed paper is still the most reliable method for production printing, and it is still the most widely used format today. Tractor fed braille printing ensures that the paper is correctly fed into the printer and that the user doesn’t have jamming-related errors. Using braille paper rolls is also an extremely reliable way of producing. 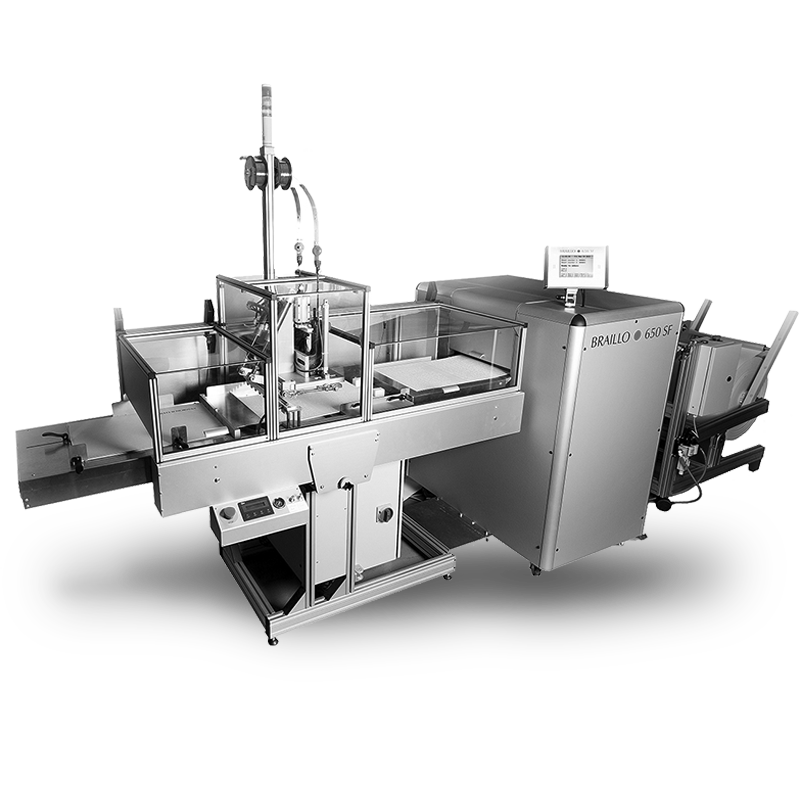 It is less expensive than using tractor-feed and you don’t have to change paper frequently. In a Braille production environment, cut sheet paper is not recommended, nor efficient. 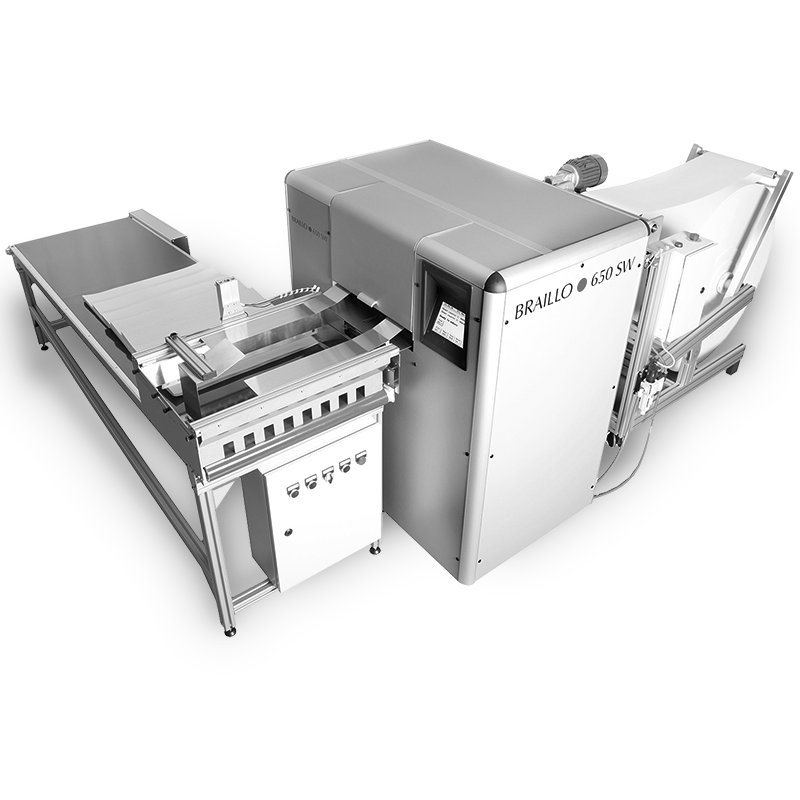 These embossers only allow for a maximum of 50-100 single sheets to be loaded at a time, and the paper can more easily get jammed in the braille embosser. The recommended paper weight is 140/150 GSM or 100 LB – anything less than that won’t withstand the heavy demands of Braille production or repeated reading by a blind user. Be cautious of using traditional copy paper or paper from a local office supply store. This paper is too thin and as soon as it goes through the embosser, the Braille pin will poke right through the paper or after the first time a finger slides over the dot, it flattens out. Basic office supply paper is too weak for embossed Braille and thus, a disservice to the blind reader. Ask to see a sample of standard Braille paper vs traditional copy paper – Braillo will be happy to provide you with both so you can feel the comparison. Transcribers and proofreaders work extremely hard to ensure that the file they’re sending to the Braille printer comes out correctly. The only way to properly ensure Braille translation, comes from using a professional translation software. Braillo includes a copy of Duxbury for free with every Braillo braille printer purchase, Duxbury is the most trusted Braille translation software. Braillo will also gladly provide a list of additional recommended software programs. Printing directly from your computer, phone or tablet without such software simply is not productive if the Braille output is incorrect, as there are too many variables (Grade 1 vs. Grade 2 vs. Grade 3, 6 dot vs. 8 dot, languages, punctuation, etc). Additionally, most Braille embossing production centers will be sending files from their computer, not a tablet or phone. There are numerous ways in which Braille printers can be connected to a computer: serial/parallel ports, usb, ethernet and WiFi. While the days of serial/parallel ports are gone, there are still adapters available that ensure that this method is still an option, albeit not as reliable. 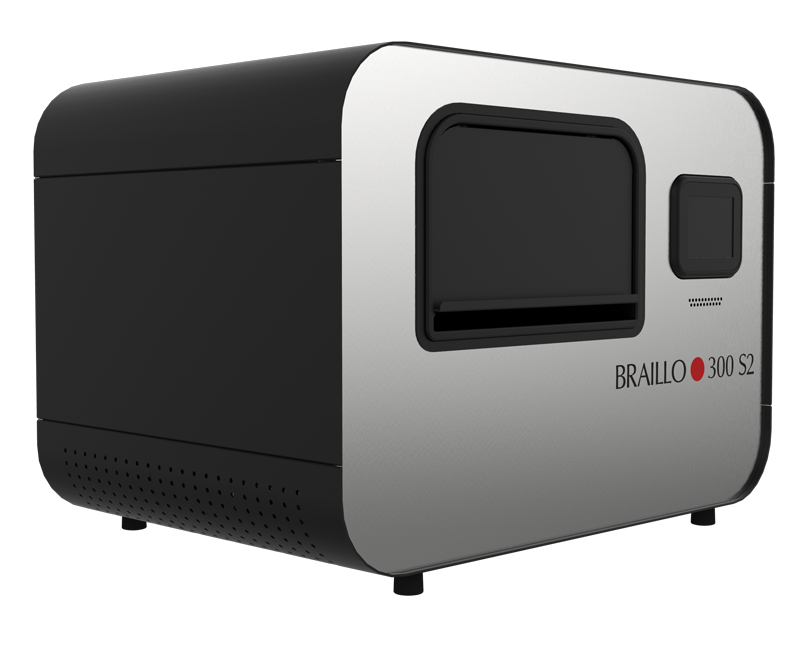 Braillo currently offers a USB connection, as well as Ethernet. USB is a direct connection between the Braille printer and local computer, which is a very reliable and practical way of embossing braille. Ethernet connections are another reliable method which allows the printer to easily be set up to a local area network and accessible by many computer stations. WiFi printing is the least recommended option in a Braille production environment, as it is susceptible to “dead spots” and breaks in communication. How many times has your cell phone or in-home wi-fi dropped for a few seconds? If this happens while embossing braille it means the quality of that print run is in question. If you’re printing many of pages of braille via a WiFi connection, it’s critical to have somebody checking each page of Braille to ensure that there wasn’t a break in the WiFi connection during transmission, which results in a malformed sentence. Braillo offers printer support via telephone, email, YouTube videos and on-site repair by either Braillo staff, or our network of factory-trained braille printer technicians world-wide. Braillo offers training sessions across the world throughout the year, in addition to other Braille workshops. While some manufacturer’s offer remote support, this is typically an online chat session that doesn’t resolve actual hardware issues. Instead, Braillo offers a real technician over the phone or internet that will spend the time with the customer in order to properly diagnose and resolve the issue, whether it’s hardware or software related. The investment in a Braillo braille printer (or any Braille printer) is a big one, so please rest assured that it is Braillo’s highest priority to ensure that your embosser is running properly and that you are satisfied with your investment.